New Orleans, LA, or N’awlins for locals, has a unique flavor all its own, and plenty of budget-friendly options. Once dubbed “The City that Care Forgot”, it’s certainly a perfect destination to let all your worries fade away. According to their tourism board, it’s also the “Festival Capital of the World”, with dozens of festivals taking advantage of the welcoming New Orleans weather throughout the year. Whether you’re taking in the wild party atmosphere of Mardi Gras, enjoying the smooth sounds of Jazz Fest, sampling the bold flavors of Cajun and Creole cooking, touring the beautiful and historic mansions of the Garden District, or seeking out the spooky and macabre, the Big Easy will not disappoint. Here are some tips to keep your visit on-budget and enjoyable, no matter if you’re in town for business or pleasure, staying for a road-trip stopover, a weekend getaway, or a longer vacation. Mardi Gras is known as “the biggest free party on Earth”. This massive festival originally began as a last hurrah before the more austere season leading up to Good Friday. Mardi Gras literally means “Fat Tuesday”, for French Catholics it was the last day to enjoy decadent foods before the ritual fasting of Lent. In NOLA, the festivities start 12 days after Christmas (the “Twelfth Night”) and culminate the day before Ash Wednesday, 47 days before Easter. Because the crowds descend on the French Quarter for Mardi Gras, you’ll need to book ahead of time. The best deals on flights can be had months in advance, so you’ll want to make your reservations the summer before. (Yes, we do mean six months early.) Check your favorite deal sites early and often. And don’t forget to check in with our Travel Deals for sites like Priceline, Expedia, Groupon Getaways, Orbitz, Southwest Vacations, and Travelocity. You’ll also need somewhere to stay. With about 38,000 hotel rooms in the city, and 1 million visitors for Mardi Gras, it’s easy to see that rooms will sell out fast. Even six months out, you’ll pay $200+ per night for the absolute cheapest rooms in the French Quarter, where the heart of the party is found. You can often find less expensive accommodations on sites like Airbnb, but do your research before booking. Some of these are pretty far from the action, and you don’t want to find yourself paying more than you counted on (in both time and money) to commute to and from the party. If you are planning to commute, consider a room in one of the suburbs of the city. Prices there will still be high during Mardi Gras, but not nearly as much as those near the parade routes. Next, you can have plenty of fun for free in the streets, but you’ll need to show up early and be prepared for crowds all day. Also, you’ll need to eat and drink. If bar hopping is your idea of a good time, you might want to stay away from Bourbon Street. Food will be cheaper away from the main drag too. And restroom availability in the heart of the party can be a big problem. Our suggestion is to spend some time in the thick of it, but plan to also venture away from time to time. Pro Tip: According to Angela Colley of DealNews, your best bet may just be to skip the big day altogether. You can enjoy plenty of Mardi Gras revelry in the days and weeks leading up to Fat Tuesday, but the prices go through the roof on the day itself. Check the official schedules, and book your trip to coincide with one of the earlier parade days. Your wallet will thank you! The rest of the year, the French Quarter of New Orleans is still a great place to visit. It’s packed full of history, culture, and plenty of NOLA fun. Largely undisturbed by the floodwaters of Hurricane Katrina, the Quarter remains a tourist magnet for those visiting New Orleans. If your plan is to spend most or all of your time in the Quarter, you won’t need to worry about a rental car. Almost everything is within walking distance of everything else. And if you can’t walk there, you can always hop on one of the iconic and historic streetcars. 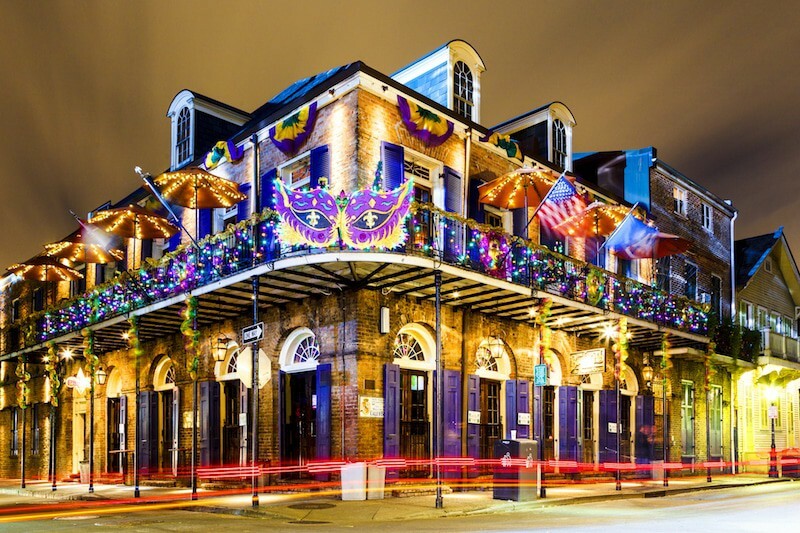 If the nightlife and party scene is your thing, be sure to check out Bourbon Street. It features about eight blocks of bars and restaurants, and almost every night there’s a party to be had somewhere. For a somewhat less bawdy experience, check out Royal Street. Just a block from the bars and the parties, you’ll find a variety of art galleries, antique stores, and more. It’s a fun destination for window shopping, since the wares offered tend to be on the pricey side. Every afternoon, three blocks of Royal Street are closed off to traffic, and you’ll often find a variety of street performers there, including up and coming jazz musicians. From Royal, travel one more block closer to the mighty Mississippi River, and you’ll encounter Chartres Street. Because it’s less well-known than it’s neighboring promenades, Chartres features fewer crowds and less expensive prices. You’ll find the same preserved colonial architecture, along with a variety of local shops, cafes, and bars. Jackson Square is one of the must-see stops in the city. It’s also a perfect place for free entertainment! Here you’ll see plenty of open-air performers of all flavors, from musicians to painters to palm readers. It’s also a great place to encounter street vendors, outside the park’s fences. Be sure to check out the stunning architecture of St. Louis Cathedral while you’re there. French Market: Six blocks of shopping, including fresh food vendors, a flea market, cafes and bars, and much, much more. Decatur Street: Home of Café du Monde, The Palm Court Cafe, and House of Blues, Decatur Street is a great place to catch live music, with plenty of shops and cafes throughout. House Museums: Several of the old houses in the French Quarter have since been converted to museums. Ticket prices are typically less than $20/person, with some in the $3-$5 range. Canal Street Ferry: Starting in the Quarter and heading to Algiers, the ferry is a cheap way to ride across the river. Fares are only $2/adult, $1/senior, and kids ride free! The Presbytère: If you’d like to learn a bit about the city’s history and culture, The Presbytère museum just off Jackson Square is a great place to start. Probably the most well-known neighborhood of uptown New Orleans, the Garden District houses one of the largest collections of historic mansions in the south. The district traces its history back to the 19th century, when wealthy Americans began moving to the city after the Louisiana Purchase. More recently, it’s been home to celebrities like Anne Rice, Sandra Bullock, Nicholas Cage, and Trent Reznor. Be sure to check out the area around Prytania Street and Washington Avenue, where you’ll find the frequently-filmed Lafayette Cemetery No.1, along with a charming collection of shops and restaurants. At the edge of the district lies a working class area called the Irish Channel, named for the first generation Irish immigrants who originally settled along this section of the river. You’ll find some fantastic Irish pubs there, where locals like to go to enjoy a pint or a po’boy. New Orleans is a foodie’s paradise. It seems there’s a new flavor on every block and many familiar dishes were created or perfected in the Big Easy, then exported to the rest of the country. You may not realize it, but New Orleans actually boasts two major types of cuisine. While the words may be used interchangeably by the uninitiated, Cajun and Creole food are not actually same. Creole cuisine was developed by the settlers in French colonial New Orleans, and features flavors derived from a variety of cultures including Italy, Spain, Africa, Caribbean, and Native American. Cajun cuisine, originating from those displaced to the region from their homes in French Canada, often starts with the French mirepoix basics of onion, celery, and bell pepper, then adds the variety of seasonings and spices for which it is famous. But of course, the food culture of New Orleans is a lot richer than just these two cuisines might suggest. Here are some must-try dishes, along with our recommendation of where to sample them. Beignets: These sweet breakfast pastries are NOLA’s answer to the doughnut. Deep fried and covered in powdered sugar, the premiere place to get them is Cafe Du Monde at the French Market. Breakfast here will run you about $5, depending on your choice of beverage, but be prepared for crowds. Boiled Crawfish: During crawfish season (typically March-June), you can find crawfish boils at bars and taverns all over the city for surprisingly little money. Our pick is The Original Cajun Seafood Company, where they’ll run you about $5-6/lb. Once they’re out of season though, the price will spike, so be prepared. Boudin: Boudin is a delicious sausage with its roots in Cajun cooking. Traditionally made from pork, rice, onion, and seasonings, it’s a staple of Cajun boucherie (the practice of butchering the whole hog). Less traditional options include Boudin Balls, where the sausage filling is shaped into balls and then deep fried. Our pick for traditional boudin is Cochon Butcher on the corner of Tchoupitoulas St and Andrew Higgins, where a small plate of hot boudin will cost you just $6. Gumbo: Possibly NOLA’s most famous dish, gumbo is a must try for any food fanatic. Traditionally made from vegetables, seafood, meat, and filé (powdered ground sassafrass leaves), the remaining ingredients (and the specifics of the main ones) are left up to the chef’s choice. In fact, the inclusions of tomatoes in the gumbo is a good way to tell if a menu originates from Creole (with tomatoes) or Cajun (without) traditions. If you’d like to try the good stuff, check out Parasol’s Bar & Restaurant in the Irish Channel. It’ll set you back just $4.50/cup and is a staple stop for locals. Jambalaya: Traditional jambalaya is a rice dish with meat and/or seafood, veggies, and well-seasoned stock cooked right in. It’s one of those dishes that captures the rich and diverse flavor palette of the city, and every chef adds their own signature twist. Try some for lunch weekdays at Cafe Reconcile on Oretha C Haley Blvd. You can get a side of jambalaya by itself for just $4, or enjoy it paired with any of their delicious entrees. As a bonus, the cafe revolves around a program designed to provide job training and life skills to young people in at-risk neighborhoods. Muffuletta: A staple of lunch menus at bars and delis across the city, the muffuletta is a local favorite. This enormous sandwich is built to share, so don’t expect to down one by yourself. It’s a cravable combination of various Italian cheeses and meats, spread with a spicy olive salad that gives the sandwich its signature flavor. We recommend trying out a quarter for under $6 at Alberto’s Cheese & Wine Bistro in the French Quarter. Oysters Rockefeller: While the name might make you think of New York, this dish is pure New Orleans. This one is a bit a pricier, but it’s worth the extra money to try this dish done right. It was originally developed at Antoine’s Restaurant, and we recommend trying it out at their attached Hermes Bar, where 6 oysters will run you $15. Po’Boy: Fried shrimp and french bread are the staple ingredients of this Big Easy favorite, which may come “dressed” with lettuce, tomato, pickles, and mayo. If you’re not into shrimp, try other variations like oyster, catfish, crawfish, sausage, chicken, or roast beef. Enjoy them at local favorite sandwich shop, Guy’s Po Boys on Magazine St., where you can get a 6” sandwich for about $10. Pralines: Creole pralines are a sweet treat made from pecans, sugar, butter, and milk. There are plenty of places to sample this confection, but we suggest Loretta’s Authentic Pralines where you’ll find additional flavors like peanut butter, chocolate, coconut, and rum. There the cookie-sized candies cost under $3 each. Red Beans and Rice: No discussion of food in New Orleans would be complete without the Creole staple of red beans and rice. You’ll find this dish paired with just about every type of meal in the city. A favorite hole in the wall is Cajun Mike’s on Baronne St. where they serve it up with smoked sausage for just $6/plate. Shrimp Rémoulade: Fresh gulf shrimp, covered in rémoulade sauce and served cold over a bed of greens makes for one tasty and unique dish. Try it at Mandina’s Restaurant on Canal St. for $12.50. You’ll also find a good selection of other NOLA seafood classics, as well as American staples like pork chops, fried chicken, and hamburgers. The music of New Orleans has always been an important part of the city. NOLA’s rich musical heritage and wealth of street performers, clubs, music venues, and up-and-coming talent make it a great place for music lovers to visit. You’ll find bright and happy brass bands, smoky blues clubs, and of course, that Dixieland Jazz sound the city is famous for. Probably the second biggest party of the year is the New Orleans Jazz and Heritage Festival (Jazz Fest), held each year on the last weekend of April through the first weekend of May. In addition to traditional jazz and blues sounds, you’ll find every other flavor of music Louisiana has to offer, from Cajun and zydeco bands to rock and hip hop musicians. There are always several notable names featured, from the first Jazz Fest headed up by Mahalia Jackson in 1970, to last year’s headliners, which included Stevie Wonder, Tom Petty & The Heartbreakers, and Snoop Dogg to name just a few. If you’re wondering which bands are playing in the city, be sure to pick up a copy of OffBeat Magazine, or simply visit their website. They list live musical performances from all genres, in all areas of town, so it’s a great way to keep up with the local music scene. Known as the birthplace of jazz, New Orleans is a must-visit destination for jazz lovers of all ages and tastes. If you’re in town for some NOLA jazz, the most iconic venue in town is undoubtedly Preservation Hall. The Hall is packed to the limit almost every night, so get there at least an hour early and be prepared to wait in line. Jazz in the Park: In Louis Armstrong Park, you can often find open-air performances, vendors, and more. Some performances are ticketed, but many are free and open to the public. Check out their site to get details on upcoming park music events. Frenchman Street: You’ll find several jazz clubs on Frenchman Street in Marigny. Favorites include The Spotted Cat Music Club, Blue Nile, or Snug Harbor. Candlelight Lounge: Tucked away in Treme, the Candlelight Lounge is a favorite venue for authentic jazz. This neighborhood dive bar plays host to live brass bands in a relaxed and friendly environment. Balcony Music Club: You’ll find some of the best nightly live music on Decatur Street at the Balcony Music Club (BMC for short). Even better, there’s no cover charge, and drinks are reasonably priced, so it’s a great place to experience the music scene without spending a fortune. Originating in southwest Louisiana, zydeco is a brand of music with its roots in the French Creole bayous. This uptempo dance music features instruments like accordions, washboards, and fiddles. It’s the kind of joyful sound that can be quite infectuous! If you happen to be in town at the end of June, be sure to spend some time at the Louisiana Cajun-Zydeco Festival at Louis Armstrong Park. Admission is free, and the festival is held rain or shine. Mid-City Lanes Rock’n’Bowl: One part bowling alley, one part live music venue, Mid-City Lanes hosts a variety of musical styles, but every Thursday night is Zydeco Night. Mulate’s: Hailed as “The Original Cajun Restaurant”, you can find live zydeco music here most evenings. Bring your dancing shoes! The Old Opera House: Located on the corner of Bourbon and Toulouse in the French Quarter, the Old Opera House features a zydeco band in the afternoons, followed by rock in the evenings. If you’re the type of person who enjoys tours, New Orleans is the perfect destination for you. There are so many options! Here are a few we recommend you check out, but be sure to also check our coupon pages for Viator and 365Tickets USA, as they often have special prices on touring options. For book lovers, a literary tour is a must in New Orleans. Travel + Leisure has an excellent (and free) self-guided literary tour to follow which includes notables like Tennessee Williams, William Faulkner, and Truman Capote. Perhaps your leisure tastes run a little more active? The Big Easy offers some truly enjoyable bike tours. Check out bike tour companies like Confederacy of Cruisers, Free Wheelin’ Bike Tours, and Buzz Nola. There’s also a Ninth Ward Rebirth Bike Tour for those who would like to see the remarkable rebuilding still ongoing after the devastation of Hurricane Katrina. In a city with history as wifld and diverse as New Orleans, there are sure to be a few “hauntings” about. Ghost stories abound in this spooky city, and so do ghost tours. We recommend French Quarter Phantoms’ Ghost and Vampire Tour, for an inexpensive, spooky, and fun diversion. Of course, we couldn’t possibly mention the spooky history of New Orleans without including a voodoo tour. Check out the Cemetery/Voodoo Tour from Historic New Orleans Tours for a delightful experience in the City of the Dead. If you’d rather get out of the city and experience some of the surrounding flora and fauna, perhaps a swamp tour is right for you. Our pick is the Cajun Pride Swamp Tours by Boat, which highlights the wildlife of the Manchac Swamp, about a half an hour outside the city. They also have options that include transport from your hotel if needed. Back in town, a fun and free option for art lovers is the Sydney and Walda Besthoff Sculpture Garden at New Orleans Museum of Art. Inquire at the entrance to the garden about the free audio tour, accessible through your cell phone. If you prefer to spend some time on the water, you might enjoy a river cruise on the mighty Mississippi. We recommend the Historical River Cruise aboard the Paddlewheeler Creole Queen. In addition to an hour and a half on the boat, you get to spend an hour at the historic Chalmette Battlefield, guided by National Park Rangers. Finally, a big hit with history and nature lovers alike, plantation tours are a great way to spend an afternoon in NOLA. One beautiful option is a tour of the Longue Vue House & Gardens, a lovely estate in Metairie, dating back to 1939.